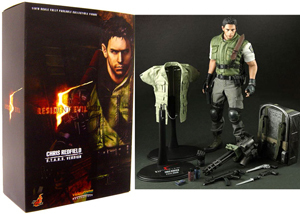 Description Of Item: The Chris Redfield 12 inch Figure features: * Hot Toys muscular body with over 21 points of articulation * Real fabric S.T.A.R.S. Uniform - olive drab tactical vest, shirt, pants, knee pads and boots * Bonus costume accessory: BSAA military jacket * Handgun / M9 * Magnum / S&W M500 * Machine Gun /MP-5 * Gatling Gun * Incendiary Grenade * Flash Grenade * Knife * Ammo Pack / Machine Gun * Magazine pouches * Knife Sheath * Belt * Holster * Headset * Radio with pouch * 3 Interchangeable posing hands with gloves * 12-inch figure stand with the Bio Hazard 5 logo and Chris Redfield nameplate. NOTE: RETURNS ARE NOT ACCEPTED.